Jarrett Boykin had 49 receptions for 681 yards and three touchdowns in 2013. When the Packers lost wide receivers James Jones and Randall Cobb to injuries in the same game back in October, they needed someone to step in and step up. Jarrett Boykin, an undrafted second-year wide receiver, has come in more than handy. “I was thrown in there immediately,” Boykin told FOXSports.com in a telephone interview Thursday. “It was like ‘all right, all this work that I’ve been doing, it’s time to prove to the world and my teammates and coaches that they can believe in me.’ When I was given the opportunity the following week to start I just put everything behind me and went out and played. It was all the same. 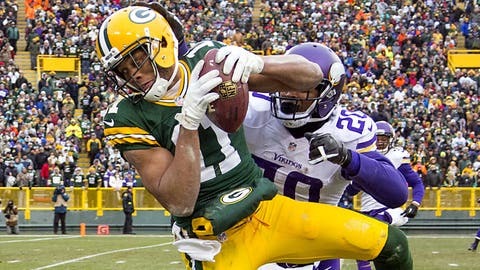 That next week Boykin planned to be a big part of the Packers’ game plan and Aaron Rodgers targeted him 10 times. Boykin hauled in eight receptions for 103 yards and a touchdown. It was his breakout moment and a long way from where he’d been a year ago. Boykin didn’t hear his name called in the 2012 NFL Draft, largely because of his speed at the Scouting Combine. When Boykin lined up in Indianapolis, he ran a 4.74 40-yard dash which, despite his decorated career at Virginia Tech, damaged his draft stock. The 6-foot-2, 217-pounder knew that he needed to make up for his lack of speed in other areas. He recommitted himself to the little things; knowledge of the game, having reliable hands and precise route running. While training for the NFL Combine, Boykin built a relationship with Jaguars wide receivers coach Jerry Sullivan. “He told me if anything were to happen, I’d be able to have an opportunity to come into camp,” Boykin said. Fortunately, the Jaguars offered the physical wideout an opportunity to impress. A few days after a whirlwind rookie minicamp, the team informed him that they brought in some other players and were moving in a different direction. Boykin was released. It was a harsh reality, but it wouldn’t break him. “After I left there I went back to school for about a week until I got my next phone call,” Boykin recalls. “I’ll tell you, it felt like a long week. The Packers wanted to add some youth and brought in Boykin. Little did general manager Ted Thompson know he was bringing in a player who would have a significant impact in a future postseason run. “I knew it was time to get down there and make an impression however I can and prove to them that I have the ability to play,” Boykin said. Boykin proved his worth in training camp and made the 53-man roster. He was used sparingly, but learned a lot from the stable of veteran wide receivers. Driver, who played 14 seasons with the Packers, retired in February but his fingerprints remain on Boykin. Learning how to watch game tape and completely entrenching himself in the playbook was a priority for Boykin. That preparation has paid splendidly. Boykin finished the regular season with 49 receptions for 681 yards and 3 touchdowns. His most significant contribution came in a Week 17 matchup against the Bears. The winner would take the NFC North; the loser would go home. Rodgers, who had missed nearly two months because of a fractured collarbone, was back. In the second quarter, Rodgers tried to throw a pass, but the ball was knocked free as he was being sacked by Bears defensive end Julius Peppers. While players on the field assumed it would be ruled an incomplete pass, Boykin heard a familiar voice yelling at him to scoop up what was a live ball. “I was running my route on the left side of the field and I was eyeing the quarterback to see where his progression was at whether he was looking my way or whatnot,” Boykin recalls. “I saw the ball come out a certain way, so I was just running over there to be on the safe side. We practice that so much I guess it became instinctive. The play was ruled a touchdown, the Packers’ only one of the first half. They would go on to win and Boykin would be celebrated. As the Packers prepare to play host to the San Francisco 49ers (Sunday, 4:40 p.m. ET on FOX), Boykin figures to be a complementary player. Since Nelson, Cobb and Jones are at full strength, it’s not likely that Boykin will be Rodgers’ favorite target, but he has already delivered.